Many fans of “The New Adventures of Peter and Wendy” have created epic stories with their online roleplay Twitter accounts, enriching the fictional town of Neverland, Ohio, in ways that even the show’s creators never thought possible. As we enter the home stretch for the official adventure in Neverland, I want to make sure that all of you who’ve played in our sandbox have the tools you need to archive your contributions to our story world, so that your fellow fans and anybody who finds our series after the fact can see all of the magic that our small town has generated. And when it comes to archiving Twitter conversations, all you really need is Storify. Today I’m going to walk you through creating your first Storify post. It’s mostly pretty intuitive, but I’ve been using it for years, so I figured I might as well try to make your first time go as smoothly as possible. You all can organize this stuff however you choose, personally I tend to have a separate Storify post for each Twitter “scene.” So let’s walk through how to create your first scene. After you sign up for your Storify account, you’re going to want to click on “New Story” in the top right. On the top left of the screen, you’ll see a box labeled “Enter a Headline,” this is where you’ll type the name of this scene. Below that, there’s a box for a description of the post, and the pane just below that one is where you’re going to drag and drop all of the social media posts that make up this piece of your story. In the pane on the right you’ll see a little icon for each of the social media platforms that Storify supports. Since most of the “New Peter and Wendy” roleplay happens on Twitter, you’re going to want to click on the Twitter icon in this section. Now, here’s the deal: Our show started several years back, so those of you who’ve been playing in Neverland since the beginning have a ways to scroll to access your old content. Unfortunately, Twitter search doesn’t remember that far back, so I’m going to tell you the best ways for you to get that old content into Storify. Once you’ve tracked this URL down, you want to stay in the Twitter tab within Storify, but click on over from “User” to “Search.” Then paste your Tweet’s URL in the search bar and that Tweet will pop right up, ready to go. But whatever method you use to find it, once you’ve located the Tweet in question in Storify, just drag and drop it into the Storify post on the left, and voila! Don’t bother hunting for a “save” button because there isn’t one, every time you make a change it will be saved automatically. And when your Storify post is ready for public consumption, just click “Publish” up at the top. For those of you coming to “New Peter and Wendy” for the first time, or for any of you longtime fans who just want to relive some of the magic, we’ve created a section on the “New Peter and Wendy” website that includes all of the episodes interspersed with a curated collection of Storify posts from the past two seasons. 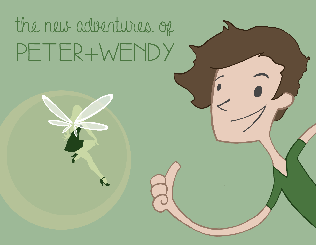 We’re also going to make sure there’s a place for your fan-submitted storify posts to live on one of the official “New Peter and Wendy” sites, so your characters and their stories can be immortalized as well!